When I first tasted these latkes, the first bite got me hooked. I love this unusual take on traditional potato latkes. Dovetailing tip: Peel extra sweet potatoes and cube them into 1/2" cubes to make 2 cups. 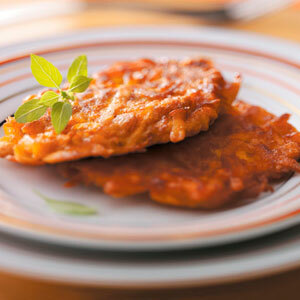 Save to use for Meal 4, Sweet Potato Frittata. In a small bowl, combine the first nine ingredients. Stir in eggs and milk until blended. Add sweet potatoes; toss to coat. Heat oil in a large nonstick skillet over medium heat. Drop batter by heaping tablespoonfuls into oil; press lightly to flatten. Fry for 3-5 minutes on each side or until golden brown, adding oil as needed. Drain on paper towels. Yield: 24 latkes.